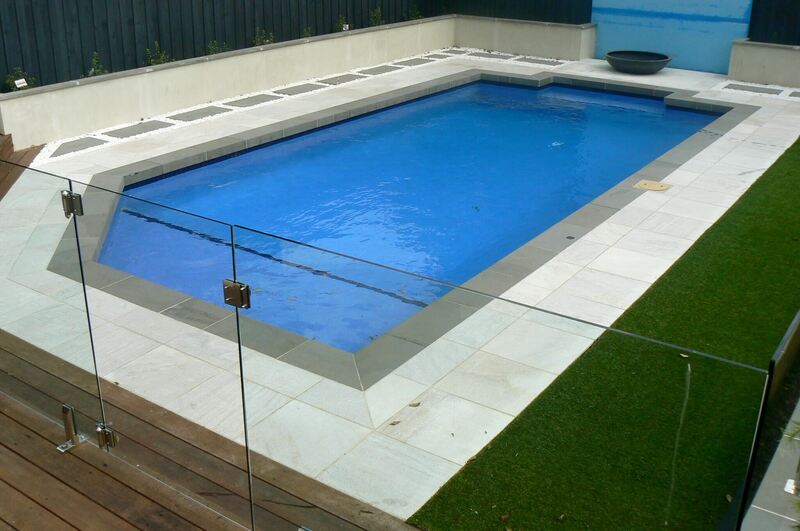 Stone & Slate Discounts have used Bluestone drop face pool edge coping tiles and white granite pool paving on this pool renovation in Melbourne. The drop face pool coping tiles used on this swimming pool were actually 1000mm x 350mm x 100mm drop with 500mm x 500mm x 18mm white granite pavers. Light Teakwood Sandstone drop face rebated pool edge coping pavers with matching Teakwood Sandstone pool pavers have been used on this pool renovation in Melbourne. THe Teakwood pool coping tiles are Stocked in 600mm x 350mm x 40/20mm. Price $38ea piece inc GST. The matching Light Teakwood pavers used are 500mm x 500mm x 17mm. Stone & Slate Discounts have used Summer Granite with an exfoliated non slip pool edge coping and summer granite pool pavers on this pool renovation in Melbourne. Sizes available 500x500x30mm Price $30ea pc, 600x300x30mm Price $39ea pc, 800x400x30mm Price $44ea pc, Other sizes by request. Raven Grey Granite pool edge coping tiles and pavers with contrasting Brazillian Quartzite crazy paving surround this pool renovation in Melbourne. Pool Coping Tiles sizes available 500x500x30mm Price $32ea pc, 600x300x30mm Price $39ea pc, 800x400x30mm Price $42ea pc, Other sizes by request. Stone & Slate Discounts have used White diamond granite bullnose pool edge coping and pool pavers on this pool renovation in Melbourne. Also we have used curved white diamond granite custom made pool edge coping tiles on another project. Sizes available 800x400x30mm Price $69ea pc, 500x500x30mm Price $59ea pc. Other sizes by request. Stone & Slate Discounts have the best Price for Quality Pool Coping and Pool Pavers in Melbourne, Sydney, Brisbane,Canberra, Adelaide. We deliver door to door. Stone & Slate Discounts can offer you the best price for your pool pavers and pool edge coping tiles since we are the largest importer/wholesaler in Australia. We stock pool coping pavers for both fibreglass and concrete pools and can custom make curved coping tiles if required. 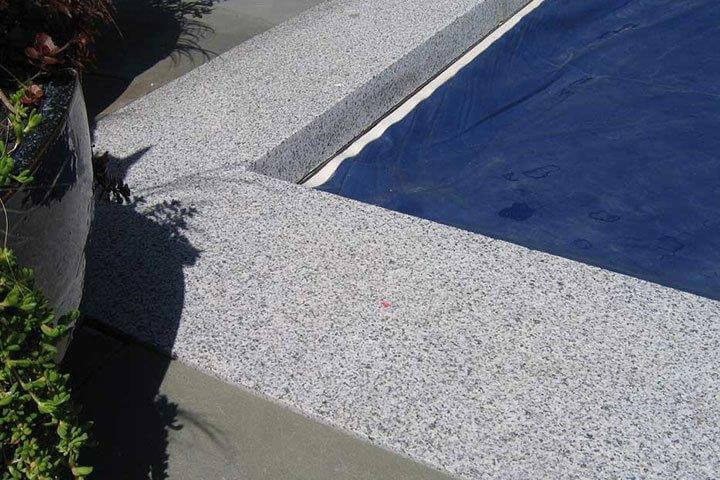 We employ dedicated industry specialists, such as expert stonemasons, to help you make the right decisions for your pool edge coping, new pool installation or pool reovations in Melbourne. They will advise you not only on selecting the right stone pool paver or swimming pool coping but also on the correct installation procedures. Door to door delivery into all suburbs of Melbourne, Sydney, Canberra, Brisbane, Adelaide, Hobart is not a problem. We deliver to ALL country towns as well. We stock the following types of natural stone pool edge coping and pool pavers with a drop face, bullnose or square edge: Bluestone ( Both Chinese and HARKAWAY), Sandstone ( Natural split surface and Honed smooth surface), Granite, Limestone, Travertine, Slate.